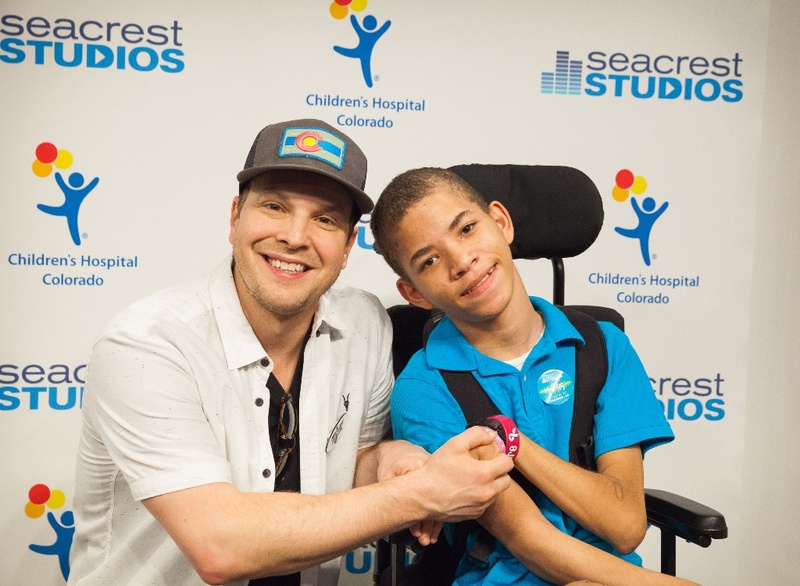 On a Friday afternoon before a big show in Denver, Gavin DeGraw came to the Seacrest Studios at Children’s Hospital Colorado. Gavin is a huge supporter of Musicians on Call—an organization that brings live music to bedsides at hospitals—and is passionate about helping kids, as well as the impact music can have on children’s lives. To help celebrate the launch of the Musicians on Call program at Children’s Colorado, Gavin came to the studio to meet patients and families, perform live, sign autographs, and take pictures with fans. Daveion wanted to know about Gavin writing his own music. Gavin made the studio smile when he said that he did write his own music, but at first only his family liked his songs. To finish the interview off, Curt asked if he had to pick one artist that really inspired you, who would it be and why? Without hesitation, Gavin answered, “Billy Joel. When I was 15 I wanted to be a doctor. As a family present, we all went to a Billy Joel concert. I watched the audience being transformed from their mood when they walked in to how they felt during each song, and the joy it brought people. It was the first time in my life I thought of music as medicine and I thought, I want to do this for a living.” Gavin encouraged kids with this message, “Whatever you do, do it because you love it. Live passionately. Whatever you love to do, do it without restriction—if it’s music, art, science, math—don’t worry about the consequences because your passion will lead you to your destiny.” Gavin shared his heartfelt thanks to Ryan Seacrest for having something like this (Seacrest Studios in Children’s Hospitals) on his heart and his mind, something so big and so sincere for a great cause. Gavin said, “Kids are so pure and so motivating and inspiring and it’s a beautiful program to be a part of. Thank you.” Thank YOU, Gavin, for a special day in studio!